Pearson Vue Trick 2019 NCLEX - Does the PVT still work? When did they apparently fix their website? 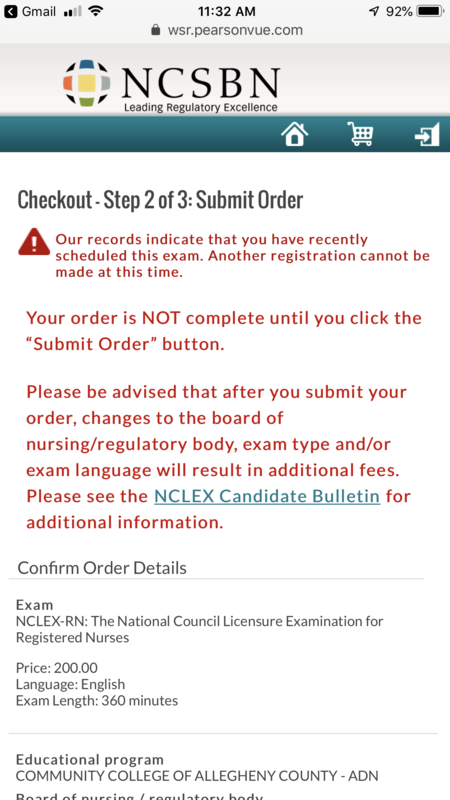 Because people on this thread have been able to re-register and pay for another exam when attempting the PVT if they failed, and they were able to do this just hours after submitting their NCLEX. So I finished my exam at 4:30pm with 171 questions and checked using the PVT at 5:30! I didn’t get the good pop up right away and started to cry. To be honest I don’t even know what the screen said cause I closed my laptop right away! Well I tried again at 6:45 and I got the good pop up! Does this mean I passed or did I mess up my results by checking too early and now it’s giving me a false positive? Best guess is that the first time you might have been told your results were on hold which is not a bad thing, just sometimes the grading takes longer for certain people’s tests. If you are now getting the good pop-up, then you probably passed. There may be a few false negative results, but we haven’t heard of any false positive results. Please report back when it’s official! Thanks for getting back to us, and congrats on passing! We’ll update the post and tell people to wait for 2 hours based on your advice. Thanks! Hey everyone so I should have my results in the next few hours… I’ve almost made it through the 48 hour wait but I just wanted to say I tried the pvt and I have been getting the “good pop up” I had the maximum amount of questions and I wanted to cry as soon as I left the testing center. I waited about 2 hours and tried the pvt trick and got the good pop up! I have tried it a few times over the last 2 days and still have been getting the good pop up! I will keep you all informed but just hoping the pvt still works !! Hope everyone else passes also !! Good luck to everyone ! I just want to let everyone know I passed !! The PVT worked for me !! This blog also helped me remain calm in the dreaded 48 hour wait ! But I am proof you can pass the test even if you got all 265 questions !! I for sure thought I failed when I left ! Good luck everyone !! thx for the update, congrats on passing!!! my 48 hour wait is up early tomorrow morning. the PVT has given me peace of mind, and hearing others going thru the same thing as well. praying the PVT works for me and i see PASS in the morning! I’ve been refreshing my state board every 15 minutes today with the hope maybe it would get posted before my 48 hour wait was up but no such luck so far! Kentucky is hit or miss with posting the day after you take it and they close for the weekend in 15 minutes so at this point i’ll probably find out tomorrow morning! thank you for looking out though!! glad you got your results so fast!! it’s a big accomplishment! i’ve gotten the PVT “good popup” since i took NCLEX so i’ve got high hopes for a positive outcome! That is so great to hear! I will definitely report back! I’m hoping it remains true! I passed!! Okay here’s what I have to say though. Make sure you definitely wait at least two hours before you check, I think I checked too early but I did read somewhere that you can check up to almost immediately after you walk out, I do not recommend doing this because for an hour I thought I failed and I was crying nonstop. Also, I did the thing with the card, I typed in my actual credit card number but a different expiration date, make sure you monkey around with the expiration date. My card expires in 2021, but when I did 2022 I would get a weird post that wasn’t the “good pop up” saying to please provide a valid care. but if I did 2020 then I would get the good pop up. So my suggestion is to definitely wait for sure two hours, even after you get the email from the NCLEX. I got my email almost instantly after I walked out of the building and yet my results still weren’t ready or something. Also, make sure you monkey around with the expiration date a little bit, obviously don’t put your real expiration date and if you don’t want to get charged but try both or year before your expiration date or year after! Hope this helps everybody! Sorry, one more suggestion to add! Pearson offers the “quick results” for just under $8. 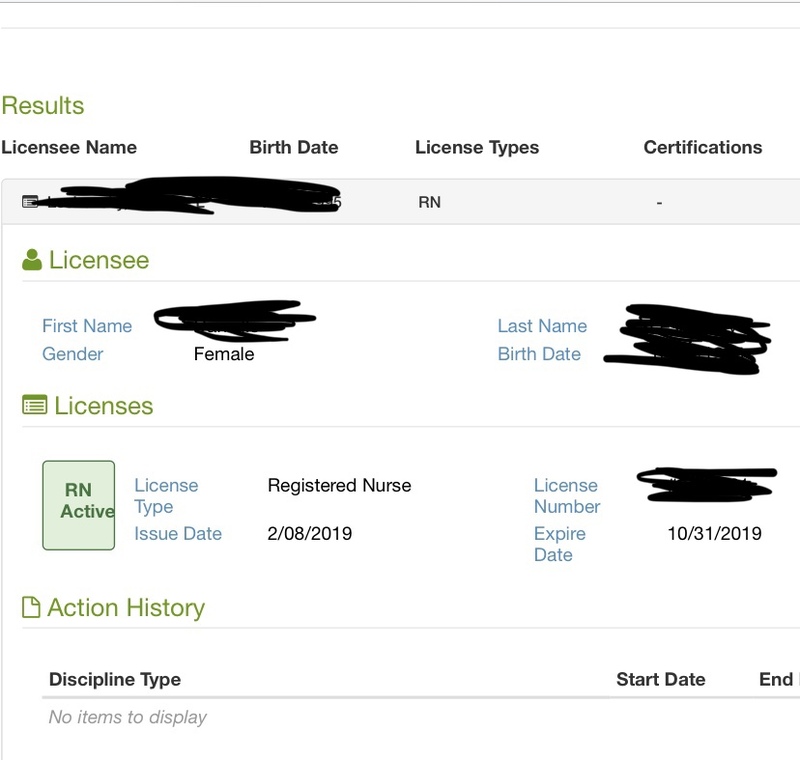 I passed my boards in Minnesota so what I did was I just searched my name in the Minnesota Board of nursing website and it popped up saying my license was active! It was also free! So maybe look into seeing if your state board of nursing website can do that for you, it’s under the “verify license” tab. They actually posted my results before Pearson Vue give me the option to see my quick results! Check your state board! My Pearson Vue quick results still isn’t up but my state board already posted!! You got this! I’ve been doing A LOT of research lately and I’ve never seen anybody say they god a “false positive” (the good pop-up) but a few that have gotten a “false negative” (bad pop-up), so congrats!!! Thank you and if you got the good result for the pvt im sure you are fine !! Keep me posted !! But I wish you luck! I was so nervous over the 48 hour wait and I’m glad yours is almost over… worst 48 hours ever lol. But I felt so much comfort after reading all these posts so I wanted to hopefully help others out over the wait! UPDATE: i was just able to check my quick results AND I PASSED!! i about drove myself crazy thinking that i would be the 1% who got the good popup but then failed. it was the worst 48 hour wait of my life. but from all the research i’ve done (and i’ve done A LOT) over the past two days, i’ve never seen anyone who got the good popup and then failed, but there IS a slim chance if you got the “bad popup” that you could ultimately still pass. SO, if you’ve gotten the good popup… celebrate, you did it! I just took the NCLEX -RN in Boise, Idaho. Has the trick worked for anyone in Idaho? I did get the Good pop up when I tried. I would appreciate a response. Thanks! Just finished the NCLEX in 75 questions. Thought it went really well. I figured I may as well wait and NOT use the VUE trick in the rare case it was a false negative as I’m sure it would cause more harm than good. I held off for 5 hours and then decided to give it a try, ha! I got the “good” pop up on checkout step 2/3 that said “Our records indicate that you have recently scheduled this exam. Another registration cannot be made at this time.” I will keep you all posted of the official result. Took NCLEX Sat. Feb 9, 8am in Cali. Shut off at 76 questions then the special research case studies. 1/2 hour later did PVT got the “candidate has an open registration” pop up. 1/2 hour after that got the “records indicate you recently scheduled exam.” It made me pretty happy but of course I was afraid to get my hopes up too high. The fact that it changed though made me trust it more, like it just took time to finalize my exam. I was scared I failed, because like many have said, the questions did not really reflect what I studied or anticipated. I felt lost and unsure. Lots of curveballs. And I was scared because the questions seemed simple toward the end/like recall questions. I got a lot of “your patient shows understanding with which statement” questions…and I really didnt get many SATA (cant tell you how many maybe 10-20 at most), almost no delegation, and not many of the really hard prioritization questions, or life or death stuff, so I was so nervous! Anyway I PASSED!!! At 11:39pm on Mon the 11th my license was posted on breeze. PVT works!!! Took my nclex today and sat for 2.5 hours and my test turned off at 150. I walked out crying and my good friend who took it with me was waiting outside in the car. I cried and told him there was no way I passed. I felt that even though I used uworld, remark quick facts, and listened to Mark k audios/notes, I felt nclex was broader. I waited 2 hours and told myself I wasn’t going to try to PVT… well I did because this 24 hour wait is HARD. I got this pop-up. I have tried 2 other times today and received the same popup. crossing my fingers hard this is right. good to know. I’m crossing my fingers to see RN next to my name tomorrow! Congrats i am happy for you!!! Pvt works. I am in south Fl. I took my exam on 2/14/19 at 0800. I did the pvt around 7 pm and i got the good pop up. I check the FL health dept website this morning around 0800 and guess what? My name and RN license were posted. Yeeeaahhhh. Yes i am a RN. Pvt os for real. Thank you for taking my anxiety away. Same! My name was posted on the Ohio board this morning! Crazy!!! Congrats!! !